Life at Innovations Academy seems great to Mena and the other girls: the men might be controlling and expect very high standards from each of the young women, but that’s normal, isn’t it? And if one of the girls were to step out of line, a punishment would be expected, because that’s just how life is for ‘exemplary’ girls like Mena. Boarding school setting, men being trash, and girls loving and supporting other girls: if you didn’t already guess, I was super here for this one as soon as I heard about it. Then, once I heard that it was being reckoned to the infamous The Handmaid’s Tale, I knew there was just no way I could miss out on this book. First of all, this book is terrifying. It takes place in a very near future—near enough that it feels like modern times—and has a slight dystopian element, but it’s done so well that I felt like it completely subverted everything most YA readers have come to expect from the subgenre. 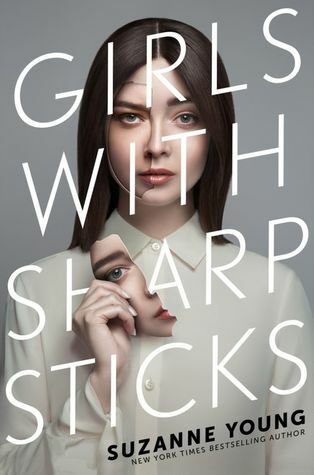 Girls with Sharp Sticks felt like such a supremely original and unique storyline that I think it’s going to be a tremendous breath of fresh air for a lot of readers. The thing is, the awful part about this story is how plausible it feels, and how close it strikes to home in ways. The men in this book are horrible, disgusting, perverse, cruel, wicked monsters, and you should know ahead of time that you will spend so much of this book absolutely enraged by the men and by the circumstances they have created—but it’s a good rage. A righteous rage, if you will. We needed each other—still do. No one else could ever understand what we’ve been through. Together, we’re strong. Flowers sharing roots in a caged garden. On the other hand, when you aren’t spitting acid over how awful the villains here are, you’ll probably be spending the rest of your time doing what I did: falling irrevocably in love with these girls and their friendships with each other. They are all so wonderfully supportive and kind to one another, and they care so much. Mena is such a refreshing heroine because, despite her tenacity and ridiculous amounts of internal strength, she’s also such a caring, worrisome, sweet soul and all she really wants in life is for herself and her loved ones to be free and safe. I am at the mercy of these men. Of these horrible, terrible, abusive men. Beyond what I’ve already said, there isn’t much else I can say, because every time you think you’ve got Girls with Sharp Sticks figured out, there’s another twist thrown in to complicate things further, and these twists were SO GOOD. I literally gasped out loud at one of them because I really never saw it coming, and that ending had me reeling! I am so glad this is the beginning of a series, because I definitely need more time with these characters and I can’t wait to see what curveball Suzanne Young throws us next. Ahhh thank you so much gorgeous!! Your words mean the world to me 😭💕 and yes please! Ooooh! I may need to add this one to my TBR!!!! Fantastic review. Thank you! It’s definitely worth checking out!! Yaaaaay, thank you so much! Such a great review! I am excited to pick this one up. Thank you!! It’s so good and I really think you’ll like it too! Yay sadly won’t be picking it up in April because of the OWLS but aiming to get to it in May. I haven’t heard of this book before but this review makes it sound so rad! It was so good! I hope you get the chance to check it out!! I think so! I haven’t read The Program but the title sounds familiar! Ahhhhhh definitely gonna read it now!! Thank you for sharing such a thoughtful review! Thank you love!! I hope you like it! OMG, okay, this sounds like a great read, but also the type of thing I need to be in the right frame of mind to get through, just because it tackles things that hit close to home. Thanks for the review!